With the announcement that Sydney Theatre at Walsh Bay will be renamed Roslyn Packer Theatre Walsh Bay as of March 2015, we take a look at this venue’s history and place in Sydney’s cultural landscape. Sydney Theatre celebrated its 10th anniversary in January 2014. It sits at the heart of Walsh Bay’s burgeoning arts precinct, which began with the conversion of The Wharf three decades ago. The largest of Sydney Theatre Company’s venues, Sydney Theatre is one of a number of industrial, heritage buildings converted into impressive arts spaces along Sydney’s Harbour. As the shipping industry has changed and moved, the arts has followed in its wake. Situated opposite Pier 6/7 on Hickson Road, 150 metres west of The Wharf, Sydney Theatre stands on the site of two old Bond Stores. 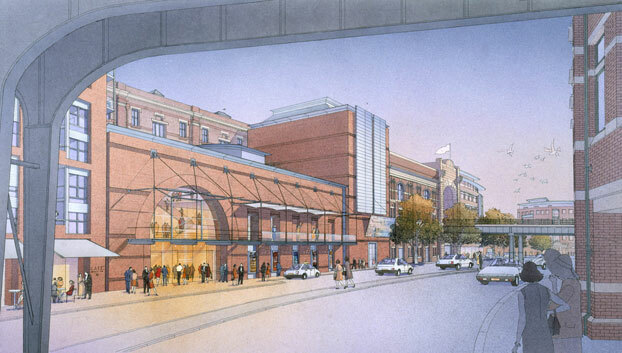 The auditorium, fly tower and foyers are located where a 1950s warehouse called Bond Store 4 once stood. The back of the theatre is located in the lower floors of Parbury No. 3 Bond Store, an impressive 19th-century brick and stone Queen Anne-style building, originally called Central Wharf. Constructed by private merchants for the wool trade in the 1890s, it was bought by the Sydney Harbour Trust in the early 1910s and renovated in the 1920s. Following World War II, the modern-style, six-storey Bond Store 4 was constructed in the north yard of Bond Store 3 but was demolished in 2000 to make way for the construction of Sydney Theatre. Plans for the theatre go back to 1994 when the State Government called for expressions of interest for the Walsh Bay development. A cultural component was encouraged and STC’s plan for a drama theatre was drawn up by architect Andrew Andersons, who had already designed several Sydney theatres including the Riverside Theatres at Parramatta, the City Recital Hall in Angel Place and the refurbished Capitol. He also knew a lot about STC having assisted the Government architect on The Wharf. 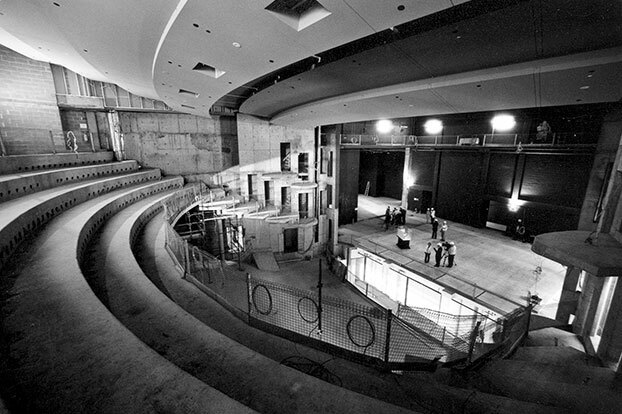 In consultation with STC’s then Artistic Director Wayne Harrison and Chairman of the Board Mark Burrows, Andersons designed a 1000-seat theatre with two circles and a gently raked stalls. However, subsequent discussions with Harrison’s successor Robyn Nevin and her General Manager Rob Brookman led to more steeply raked stalls for better sightlines, which meant losing the top balcony. Excavations at the site of the new theatre began in October 2001 and in January 2002 the first concrete was poured into the foundations. Much of the site’s maritime history was kept visible. From the beautiful bare brick walls to intact warehouse machinery to a rugged sandstone wall in the scene dock to wooden panels in the foyers made from timber salvaged from building demolished during the Walsh Bay development, the building speaks of its past. Owned by the NSW State Government and operated by STC, Sydney Theatre opened on January 10, 2004, at the start of the company’s 25th anniversary season, before a glittering crowd including Sir Tom Stoppard as guest of honour. With its 896 seats, Sydney Theatre has been the venue for some of STC’s biggest productions including Barrie Kosky’s two-part epic The Lost Echo and Benedict Andrews’ equally epic The War of the Roses along with sell-out productions of A Streetcar Named Desire directed by Liv Ullmann and starring Cate Blanchett, Uncle Vanya directed by Tamás Ascher, The Maids starring Blanchett and Isabelle Huppert, The Secret River directed by Neil Armfield, and Waiting for Godot directed by Andrew Upton starring Hugo Weaving and Richard Roxburgh. Sydney Theatre has also played host to various visiting international companies including Peter Brook’s Théâtre des Bouffes du Nord, Chicago’s Steppenwolf Theatre Company, Berlin’s Schaubühne and the National Theatre of Great Britain, among others. It has also proved a great venue for dance, with Sydney Dance Company now resident there, and has been used by various festivals including the Sydney Writers’ Festival and Sydney Festival. 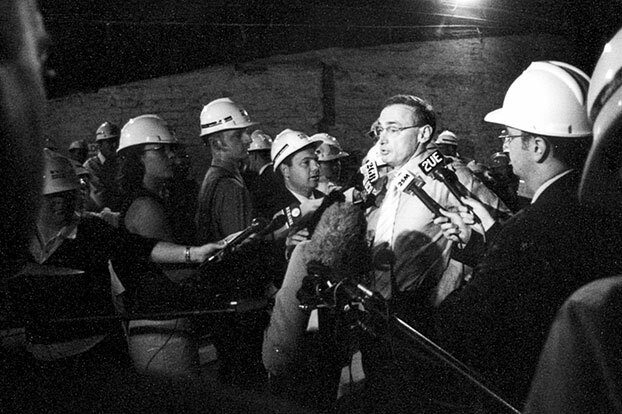 In November of 2002, Premier Bob Carr announced the name Sydney Theatre – chosen as a statement of the premiere role the new venue would play in Sydney’s cultural life. In renaming the venue as Roslyn Packer Theatre, STC celebrates one of Sydney’s heretofore under-recognised leaders in philanthropy and her commitment to the future of the arts in Australia. In honouring an individual who has been an exemplar of selfless generosity, we join with other arts organisations around the country and the world who have done the same – The Australian Ballet with its Primrose Potter Australian Ballet Centre, the Melbourne Recital Centre with its Elisabeth Murdoch Hall, Arts Centre Melbourne with its renamed Hamer Hall, and the National Theatre of Great Britain with its recently renamed Dorfman Theatre. Alongside, Roslyn’s name, the venue continues to honour two late greats of the Australian theatre with its function room named after much-loved actor Ruth Cracknell, a former STC Board Director and Patron, and its rehearsal space named after the company’s first Artistic Director Richard Wherrett. Photo credits: City of Sydney Archives; Brendan Read. Based on research by Jo Litson.